Editor, Reporter and Publisher , at the age of 12 !!! 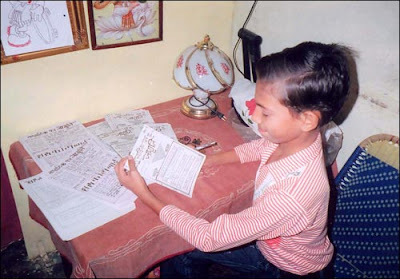 Allahabad: He is all of 12 years but Utkarsh Tripathi painstakingly brings out a handwritten newspaper every week to spread awareness among his peers on issues like the environment and female foeticide. And all this to satisfy his urge to "serve the country". A Class 8 student of the Brij Bihari Sahai (BBS) Inter College in Allahabad, Utkarsh has been bringing out the newspaper Jagriti for the last one year. And for the four-page, black-and-white newspaper, Utkarsh not only dons the role of a reporter, editor and publisher, but also turns hawker for circulating the weekly. Unlike other papers, readers of Jagriti don't have to spend a single penny -- Utkarsh distributes it free of cost. "Yes, I manage it all alone. Right from gathering the content, its editing, publishing and ultimately distributing the copies to readers," Utkarsh, a resident of Khatju colony in Allahabad, told IANS. "I know, you would like to know how I publish the newspaper. First I prepare a handwritten copy of Jagriti and later take out copies at a photocopy shop in my locality... It's simple," he explained. Jagriti has about 150 readers belonging to varied age groups in Allahabad, some 200 km from the state capital Lucknow. "Children comprise the major chunk of Jagriti readers...my school friends, my seniors in school, teachers and also my neighbours," he said. According to Utkarsh's father Hari Prasad, who runs a coaching institute, his son has a flair for writing and wanted to serve the country in some way. "More than a year ago, he read an article on Indo-China relations in a Hindi daily. I don't know what came into his mind... After reading the article, he came to me and asked me to suggest a way he could serve the country," Prasad said. "At that time I wasn't sure how serious he was about the question... I said that joining the defence services was one of the best options to serve the country... To this, he said that he wanted to start serving the society from his school life itself. I then suggested why not work like a journalist and make people aware of their rights," he added. Utkarsh took the suggestion seriously and came up with Jagriti.